Preheat oven to 220°C (425°F). Place the cheddar, gruyere, sour cream, mustard, Worcestershire sauce, salt and pepper in a medium bowl and mix to combine. Place the flatbreads on 2 large oven trays lined with non-stick baking paper and spread each with the cheese mixture. 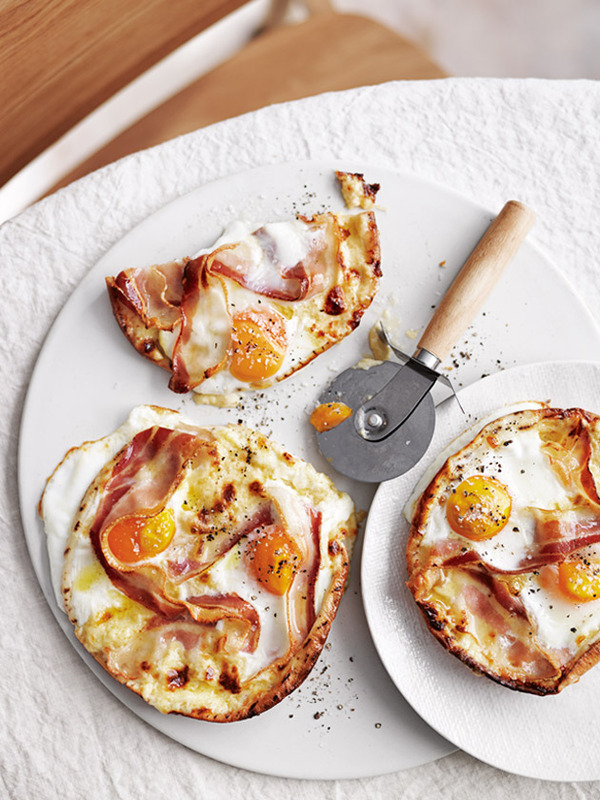 Top each flatbread with 2 slices of the pancetta and crack over 2 of the eggs+. Cook for 20 minutes or until the cheese is golden and the egg is just cooked. Sprinkle with salt and pepper and slice to serve. Serves 4. + To help keep the eggs from sliding off the flatbread, lay the pancetta in a crescent shape and crack the egg into the crescent.